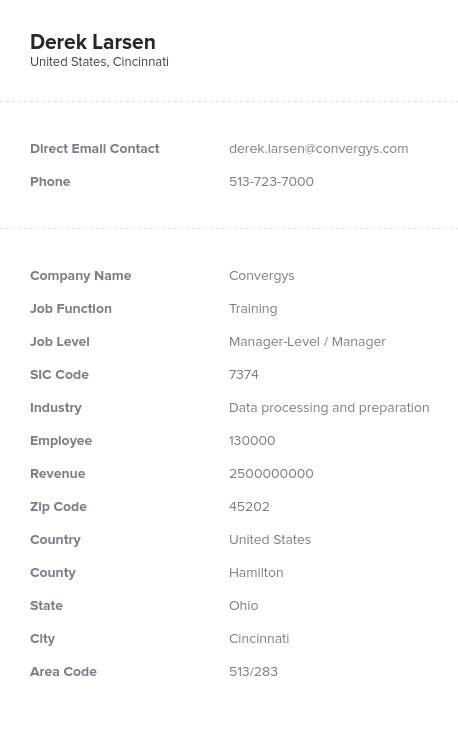 Find the contact information of those in your niche B2B target group: trainers. This data product from Bookyourdata.com contains all of the information you need to connect with professionals in training departments at multiple institutions and organizations. Try it today! As an integral part of the onboarding process, training sessions arm employees to be field-ready, often within a very short period of time. Not only do these employees need to be ready for the tasks of their specific jobs, but they need to be up to date on the policies, standards, and processes of a company. Trainers have a lot to communicate in a short period of time and use a wide variety of tools, software, services, and methodologies for getting these messages across. Help these integral employees train new workers by letting them know about your company's products or services with this premium, downloadable list. This email list is full of the personnel who work in the training departments of major companies and contains not only emails but phone numbers, names, titles, addresses, and more. Use this database to showcase your new educational tool or reveal a new way for these professionals to share new information. Market your software, technology, methods, or tools to this group using accurate, human-verified data now. Our extensive database of training professionals is available to buy and download right away. You can integrate it into your CRM and start contacting trainers right away!